Here’s a nifty little Google Easter Egg on this fine Friday. If you go to the Google homepage and click the “I’m Feeling Lucky” button with no query entered, a countdown timer will appear below the buttons. As of right now it stands at 1765472, with each second ticking off the last number in that sequence. 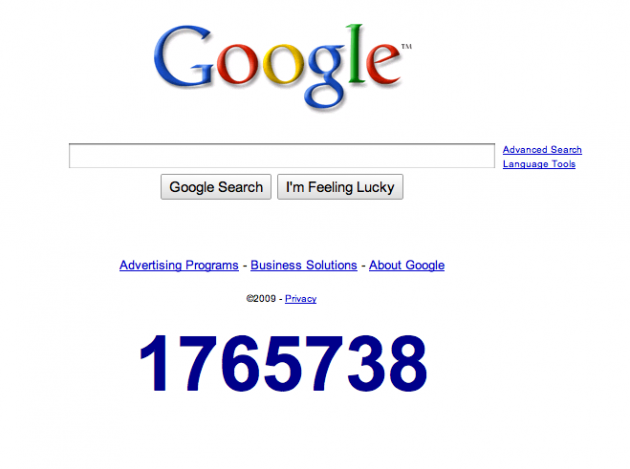 Some quick math (with Google’s help) tells us that 1,765,472 seconds equals a little over 20 days. What happens in 20 days? It could be the end of the world, when Google becomes self-aware, or 2010. You decide. To make sure, we went ahead and switched our system clocks to trick it into thinking it was December 31, and sure enough, the countdown ends at January 1 at midnight. Unfortunately, there doesn’t appear to be a payoff when the timer hits zero. Maybe Google will add that later. That is, if they got it done before the code freeze.